This is a first-line imaging test for assessment of cardiac size and function as well as valvular function and pericardial diseases. Emory offers the latest technology and has published extensively on its use. Echocardiograms are heart exams that use sound waves to produce a study of the motion of the valves and heart chambers. The technology utilized is similar to that used to examine fetuses in the womb. Without exposing patients to radiation, echocardiograms create detailed images that can provide a wealth of helpful information — including the size and shape of the heart, its pumping strength and the location and extent of any damage to its tissues. And the process can generally be performed with minimal discomfort. A full range of ultrasound services is provided by the Emory Cardiac Imaging Center. These include transthoracic echocardiograms, transesophageal echocardiograms, stress (exercise or pharmacologic) echocardiograms and carotid ultrasounds. 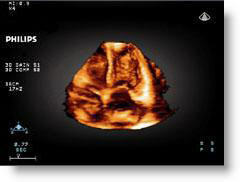 All labs are staffed by experienced sonographers. Imagine a test that is not invasive, causes no pain, only takes a minute or two to perform and produces an instantaneous, three-dimensional picture of a beating heart that can be manipulated so a doctor can see the organ from any angle — almost as if he or she were holding the patient's heart in his or her hands. Sounds like futuristic science fiction? It's not. Instead, it is a new advancement in echocardiography in use now at Emory, where the echocardiography laboratory is the first in Georgia to offer 3D ultrasounds of the heart. The new 3D technology can help doctors make better diagnostic decisions because they can view the data from any angle and see views not obtainable from conventional two-dimensional echo. For more information, call Emory HealthConnection℠ at 404-778-7777 or 1-800-75-EMORY from 7:30 a.m. to 6 p.m. EST (Monday-Friday).